I IZ NOODLES THE CAT: Jaguar versus Caiman; Who will win this epic battle? 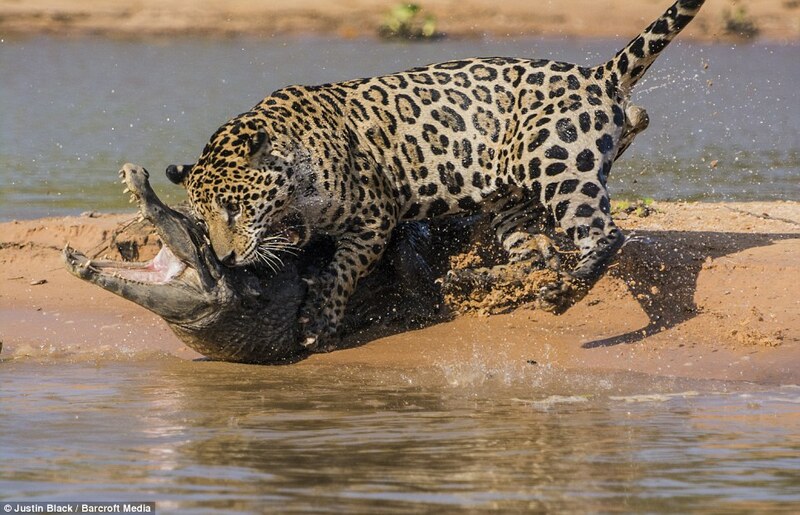 Jaguar versus Caiman; Who will win this epic battle? We already know jaguars are great hunters, but this particular jaguar (called Mick Jaguar) has been seen capturing a caiman of 150lb. The entire attack has been photographed by Justin Black. Justin said: " He lifted the 150 lb caiman from the ground and trotted toward the water like it was a doggie bone. The fact he attacked from the water is astonishing. It was reminiscent of crocs attacking land animals in Africa". According to scientists, there are an estimated 4.000-7.000 jaguars in the Pantanal of Brazil. The jaguars have become specialist caiman killers and hunt during broad daylight. That way they can surprise the coldblooded reptiles while they warm up in the sun.